Falling objects on a construction site can cause some of the most serious injuries, including paralysis, and can even result in wrongful death. 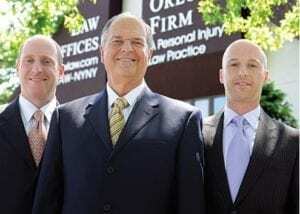 The lawyers of The Orlow Firm are experienced in representing individuals who have been injured by falling objects at construction sites and elsewhere in Brooklyn, Brooklyn, Brooklyn and Manhattan and throughout New York. Construction sites are busy, with work ongoing in several areas at one time. As a result, workers can be injured by falling objects in a variety of ways. Workers may not have been properly trained, or the site may not be managed up to legal standards. Depending on the height from which the bolt fell, the speed or velocity the bolt gains while falling may be a crucial factor in your case. If the falling item was as large as a tool or heavy piece of equipment, the injury could be severe and may even result in wrongful death. If you have been injured by a falling object at a construction site or elsewhere, you should contact a lawyer as soon as possible to discuss your right to recover compensation. Even if you are receiving workers’ compensation benefits, you may be eligible for additional damages if a third party (someone other than your employer or a co-worker) caused your injuries. Examples of third parties include manufacturers, subcontractors and landlords. To learn more, visit our construction accidents practice center. At The Orlow Firm, we can conduct a thorough investigation to determine whether any third parties can be held liable for your injuries. Claims for third-party negligence may result in higher damages than workers’ compensation alone. If you or a loved one was injured by a falling object, discuss your case with one of our Brooklyn falling object accident attorneys. We offer free initial consultations, and our cases are handled on a contingent-fee basis. This means we are paid only when we recover money damages in your case. Expenses are also advanced until the conclusion of the case.